Once the server cables are connected and placed inside the CMA, open the velcro cable straps and wrap the straps around the CMA securing the cables inside the CMA. 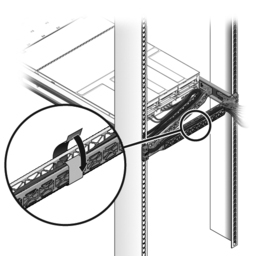 Caution - Verify the operation of the slide rails and CMA, and cable service loops. Perform the steps in the following procedure again before continuing: Verify the Operation of the Slide Rails and the CMA.